Over the past 40 years, Bolivia has experienced an average of one “social conflict” per day, according to the non-profit Center for the Study of Economic and Social Reality (CERES), based in Cochabamba. Their recent report measures episodes of conflict reported in the press, ranging from street protests to general strikes, road blockades, and regional mobilizations. Until recently, the highest rate of reported conflicts (averaging 50 per month) occurred during the administration of President Hernán Siles Suazo (1982-1985), who presided over the worst period of hyper-inflation in Bolivia’s history, sparking massive and violent social protests. Credit: Bolivia Information ForumThat record has now been surpassed during Evo Morales’ presidency, with 50.4 conflicts per month taking place through the end of 2010. In contrast to the past, says CERES analyst Roberto Laserna, today’s protests stem from a wave of rising but frustrated popular expectations. Social sectors and workers increasingly want to see a share of Bolivia’s newly found economic prosperity—including $10 billion in international reserves and a healthy budget surplus--“in their pockets.” The rhetoric of the 2009 Constitution, says economist Gonzalo Chávez, promises “instant economic satisfaction” to Bolivia’s 10 million citizens. Laserna also points out that while today’s protests may be more numerous, they are not nearly as violent or intense as the conflicts of past decades, since the government, for the most part, is not repressing the protestors. Underlying these statistics is the defining role played by Bolivia’s social movements-- arguably the most powerful and combative in the hemisphere--in the country’s political history. In its June Bulletin, the UK’s Bolivia Information Forum (BIF) provides a “road map” to Bolivia’s social movements, cataloguing the principal campesino, indigenous, worker, urban, and women’s organizations, their historical evolution, their relationship to the MAS (Movement Towards Socialism) party and government, and some of the conflicts that have emerged between them. Recent protests against the Gasolinazo and the conflict over wage rates last April, BIF notes, demonstrate the fluidity of these constantly changing relationships. 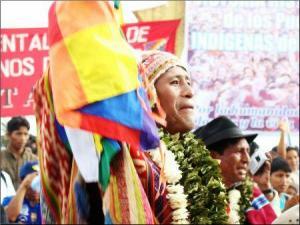 As journalist Ben Dangl explains, for many Bolivians in this poorest of South American countries, where corrupt political parties have traditionally ignored the needs of the 60% indigenous majority, social protest and grassroots activism are an accepted part of everyday life, a means of survival. “This capacity to mobilize translates into a diversity of movements that are ready to take action when necessary, whether it’s to hold Evo Morales’ feet to the flames, or mobilize against the right and foreign corporations,” says Dangl. Historically, Bolivians have also had a knack for reproducing and transplanting their familiar patterns of collective action to new settings as economic and social circumstances change. When neoliberal structural adjustment policies forced thousands of highland miners out of work in the 1980s, undermining Bolivia’s militant trade union movement, ex-miners—along with indigenous highland farmers displaced by cheap food imports and shortages of productive land—migrated to new regions, bringing their collective and organizational traditions with them. There, they formed new, territorially-based organizations that became the core of a new set of social movements. In Cochabamba’s southern hillside neighborhoods, FEJUVE mobilization, La Paz 2004. Credit: Ben Achtenberg urban water cooperatives organized by ex-miners played a key role in the successful struggle against water privatization in 2000. In the Chapare jungle, powerful cocalero union federations formed by highland migrants (including Evo Morales) resisted the U.S. –led drug wars, took control of local governments, and were instrumental in forming the MAS political party. In the sprawling indigenous city of El Alto, resettled miners and peasant unionists mobilized for public services through 600 democratically-elected neighborhood committees affiliated through FEJUVE, the Federation of Neighborhood Councils. FEJUVE became the chief protagonist in the “Gas Wars” that ousted two neoliberal presidents, paving the way for Evo Morales’ election in 2005. With this rich history and legacy, one social conflict a day is hardly surprising.